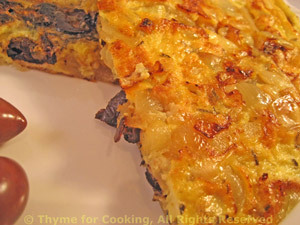 Caramelized Onion Crespèu with Olives, from Thyme for Cooking. Caramelizing onions is a bit time-consuming but not at all difficult. The slow-cooking allows their natural sugars to surface and brown. The sweetness is offset by the saltiness of the olives. Heat oil in medium nonstick skillet. Add onions, garlic and sauté over medium heat until onions are tender and starting to turn golden. Add chicken stock and cover. Continue to cook, medium-low heat, for another 20 minutes, until very soft. Remove cover and cook off any liquid, if necessary. In medium bowl whisk eggs and thyme. When most of the liquid is gone from the onions spread them out nicely in the pan and pour in the eggs. Turn heat up to medium. Do not stir. Sprinkle the olives on top. When eggs are cooked through you need to turn it: slide it carefully onto a plate, put another plate on top and turn it over. Now slide it back into the pan to brown the other side, another 1 - 2 minutes.